Zojirushi has some small appliances. Their bread machines are popular as a higher end home baking system. They also make a couple coffee makers. What makes them different is that they have ways of making iced coffee easier. Their Fresh Brew Plus 12-Cup Coffee Maker allows you to brew iced or hot coffee in the same machine. The iced coffee will be more concentrated to make up for the ice you add. It has 4 settings for the warming plate so you can turn it off if you make Japanese iced coffee – coffee that is brewed directly into ice. It has a glass carafe. It comes with an ice basket that helps with measurement of how much ice to use. The Fresh Brew Thermal Carafe Coffee Maker brews up to 10 cups of coffee. It has a pre-infusion cycle that wets the coffee grounds that allows the coffee to bloom. Both coffee makers have a filter basket that side loads making it easier to keep under cabinets. You may have heard of Makita. They make power tools. You may have seen them in your local hardware store. Makita has ventured into making a coffee maker. They have a cordless model, the DCM500Z, already out but this is is an 18V lithium ion model. This new one is not your typical coffee maker. The CM501DZ runs on the same lithium ion battery packs that many of Makita’s power tools run on. The largest battery pack, the 18V BL1860 is good for brewing about 5.3 cups. That may not be much, but if you are a construction worker on the job and crave your brew, you can make coffee on the spot. They already are selling in Japan. They expect this model to popular with construction workers. But you can take it camping, on a hike, or even use it during a power outage. The Victor crew came across this cute video that some college students came up with. Using a coffee pot and Alexa via a Raspberry Pi hooked to a microphone, they can ask the coffee maker for the weather. They added two arms: one places the filter in place and the other scoops the grounds. Not a very good job though. It also cannot be asked to start the brew process. They added googly eyes to the top and as the weather report is given, it looks like it’s actually giving the weather report. First of all, this instrument has a built-in scale and an app. It will also brew coffee as pour-over, immersion, or cold drip. WHAT?! The only thing it doesn’t do is grind. So there is a Bluetooth scale that will show amounts on the app on your phone so you can make sure you have the right ratio of water to coffee. You can save your data and even share it. There is a valve that allows you to choose which brewing technique you prefer: open it for pour-over, close it for immersion, or set the drop flow for cold drip. Note: Cold brew will still take 8 1/2 hours to make. One drawback is it will only make 10 oz. using any method. They claim it would destabilize the construction. They recommend you make it stronger and add more water after you pour it. If you were early, you could have gotten Gina for $145; there are 7 left for $160; you can pledge $175, $200 (you’ll also get a mug and specialty beans), $290 (2 Gina coffee makers), $540 (4 Gina coffee makers), $550 (one gold-plated Gina), or $990 (9 Gina coffee makers). You can also just pledge $25 for a Gina mug. This new boutique coffee press, the Duo Coffee Steeper, is like a French press with a twist. It has two chambers. You place the grounds in the top chamber. Add your filtered water. You can twist it to make the coffee as strong or weak as you want. 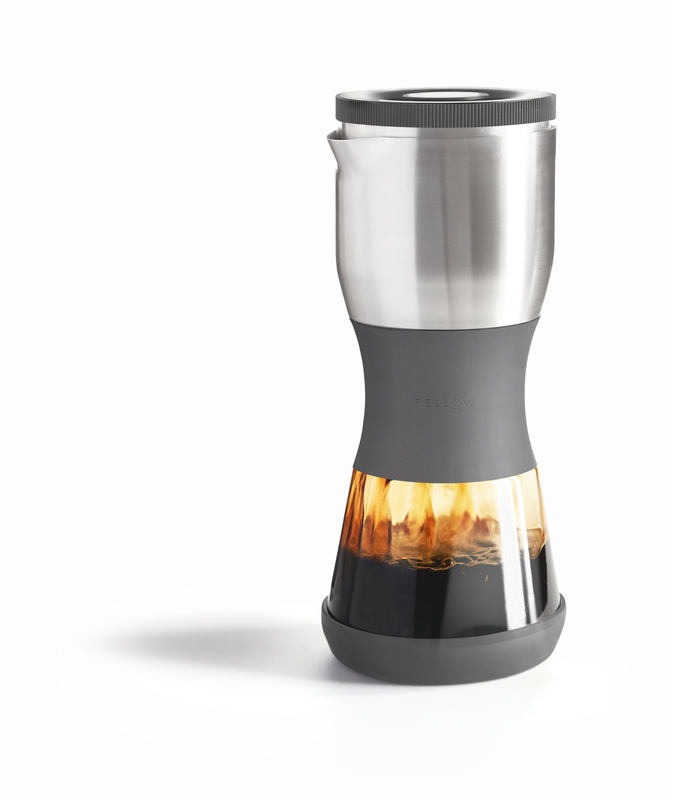 You can use this baby to make regular coffee, cold brew, or even steep loose tea. You will need the special tea filter for loose-leaf tea. This pot is just glass, stainless steel (the good kind), and silicone. It comes in three colors (middle ring): cool grey, deep blue, and maroonish. They are made and sold in batches only. At this writing there are 1028 left in this batch. Own one for $99.00.